Weather - Summer: March to May, Monsoon: June to September, Winter: October to February. Climate of Chhattisgarh is subtropical in nature making summers hot and winters intensely cold. By Air - The state has a domestic airport, which is linked, to almost all major airports in the country. By Rail- Raipur Railway Station situated on the Mumbai-Kolkata trunk route. Some others stations are connected through trains originating from Bilaspur & Durg. By Road - The road-network in Chhattisgarh is excellent with 11 National Highways. The National Highways (NH) 6, 16 and 43 connect all the major cities and towns of Chhattisgarh to other parts of the country. The state of Chhattisgarh is new, but the land’s history is as old as the time. 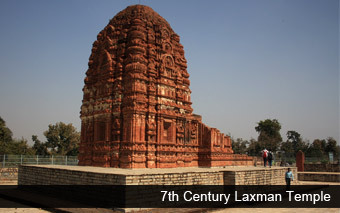 Known as Dakshin Kosala in ancient texts including Ramayana and Mahabharata, this state’s modern name is derived from its 36 districts, 36 in Hindi is ‘Chhattis’ and ‘Garh’ is the district, bringing up the name Chhattisgarh after its separation with parent state Madhya Pradesh as the 26th state of India. Bordering Madhya Pradesh in the north west, Maharashtra in the west, Andhra Pradesh in the south, Orissa in the east, Jharkhand in the northeast and Uttar Pradesh in the north, Chhattisgarh is a thickly forested natural paradise. 44% of the state is covered by forests, placed in Deccan bio-geographical area. The 22 dense forests of the state serve as an important ingredient, lending uniquely rich biological diversity. Plants, farmlands and trees are considered much more than just a natural counterpart. They are a part of life and are respected for their medicinal importance. The forested region is prominent for another reason as a home for tribal population. Some of these ancient inhabitants are India’s oldest tribal communities. Tourists for a rich tribal tour prefer to visit Bastar, a tribal capital and cultural center of the state. Each tribe is known for its rich history and culture of music, dance, dress and food. What's common to all is the way of life attuned with nature that has not changed over centuries. There is a lot more associated with tribes of Chhattisgarh that can be lived and experienced by visiting in the tribal villages, haat bazaars, and purchasing tribal jewellery as a handpicked souvenir of the state. A special kind of silk, “Kosa” can also be picked up during a Chhattisgarh tour. 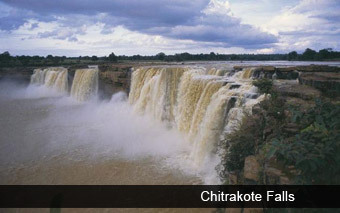 Waterfalls form another natural bounty on the land of Chhattisgarh. In fact, the finest waterfalls in India including Chitrakoot waterfalls belong to this state. Also, there are palaces, temples, forests, wildlife and fairs and festivals that attract tourists to this bountiful state of Incredible India. More than 1/3rd of the state is covered with forests, providing perfect grounds for wildlife to flourish. India’s richest bio-diversity habitat, Chattisgarh serves as a home for tiger, leopard, gaur, sambhar, chital, nilgai and wild boar. The rare species of wild buffalo and hill myna also are the rich members of vibrant state’s fauna. The Tansen Music Festival is held around October/ November each year, attracting classical musicians and vocalists from all over India. Eat – One must try Chila, Fara, Bobara, Pidia, Thethri, Khurmi, Khaja-Gulgula, Aeidsa, Bada and Bafauri during a tour to Chattisgarh. Buy – Wooden figurines, oil lamps, bamboo furniture, clay pottery, Bell metal, Terrakota, Bamboo and wood craft, Tattooing, Stone Carving. Hotels – Good number of hotels in Chhattisgarh are located in Raipur.